ArtBuilt, in partnership with NYC Parks and Queens Museum is thrilled to announce the 2018 ArtBuilt Studio in the Park project for Flushing Meadows Corona Park HamacaS by Liene Bosquê. ArtBuilt Studio in the Park is a six-week residency program that provides an artist or artist collective use of a 150-square-foot mobile studio space in a public park for a community-engaged art project. Operating out of Flushing Meadows Corona Park since its inception in 2015, ArtBuilt Studio in the Park is expanding to all five boroughs of New York City in 2018 and 2019 with the support of the Our Town grant from the National Endowment for the Arts (NEA). For the Queens iteration of the program from Oct.1 to Nov.15, we welcome artist in residence Liene Bosquê with her project HamacaS. HamacaS reflects the complex relationship of immigrants rebuilding a life in a new country without leaving their own culture behind. Liene Bosquê’s piece views hammocks as a central element symbolic of Latin American culture, and a starting point to discuss recent immigrant issues, cultural diversity and neighborhood change. 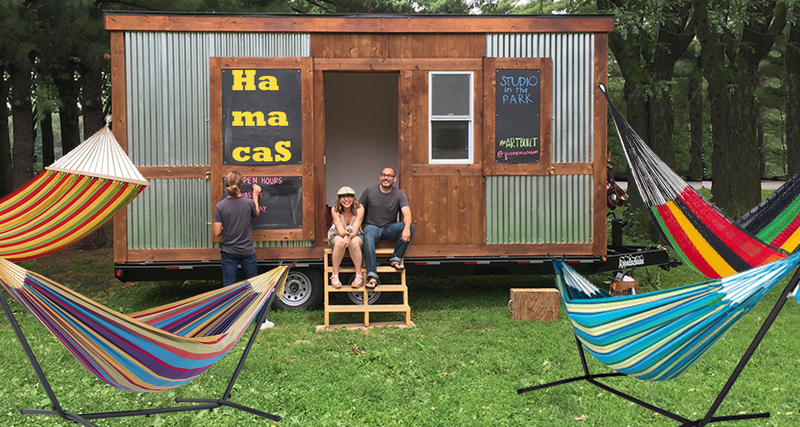 HamacaS will be an interactive installation of looms and hand-woven hammocks that aims to capture the physical and emotional displacement experienced by immigrants in the United States. It will consist of free English and Spanish language workshops in which participants engage in a collective hammock weaving installation. The hammock installation will act as a safe and healing space for the participants by reconnecting them with process of making something by hand and offering a space to lay down. The goal of HamacaS is to foment the discussion on issues of immigration and resilience and its relation to art. HamacaS will open to the public on Oct. 6, 2018, offering an ongoing series of public workshops and special events. Nov 11 – FINAL CELEBRATION – join us for music and refreshments as we celebrate the culmination of HamacaS! All workshops and events will take place at the ArtBuilt mobile studio located on the lawn in front of the Queens Museum. In case of rain, workshops will take place inside the museum. Liene Bosquê is a visual artist and art educator based between New York and Miami. She holds a MFA from the School of the Art Institute of Chicago, a BFA from the São Paulo State University, and a BA in Architecture and Urbanism from the Mackenzie University, both in Brazil where she is from. Bosque was artist in residency at the Lower Manhattan Cultural Council Workspace and received the Emerging Artist Fellowship from the Socrates Sculpture Park both in NY. Bosquê’s installations, sculptures, performances, and site-specific works have been exhibited internationally at locations such as MoMA PS1, the Museum of Contemporary Photography in Chicago, and among other nonprofit galleries and public spaces in Brazil, Portugal, Italy, South Korea and United States. In addition to serving as a mentor for the New York Foundation for the Arts’ Mentoring Program for Immigrant Artists, Bosquê’s experience included teaching sculpture at Tyler School of Art, at Temple University. ArtBuilt Studio in the Park is made possible by the National Endowment for the Arts, Surdna Foundation, the New York City Department of Cultural Affairs and The New York Community Trust.